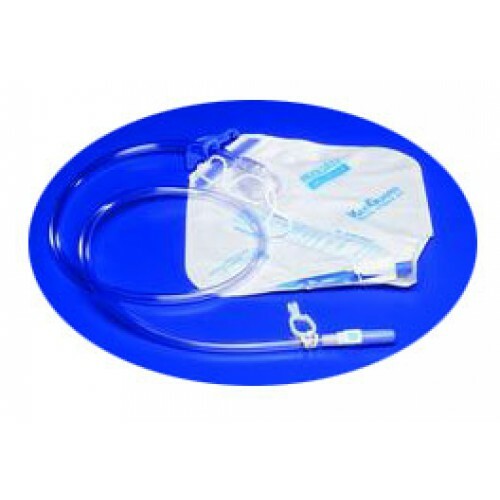 Urine Bedside Drainage Bags 2000cc withreflux valve, manufactured by Kendall, are convenient, easy-to-use and high volume capacity. These drainage bags come with a universal hanging device and feature easy-to-read graduations. Kendall is a trusted name in quality urinary supplies. 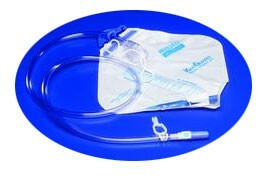 Anti reflux in a urine bag minimizes back flow into the drainage tube. This helps prevent infections. These bags do not flow. The urine just stayed in the hose causing distress to me. Tried several of these with same result. I give one star because it might last you till you replace it with a real drainage bag. The empty tube is in two pieces, a blue rubber tube from the bag and a clear tube extension. This product could be improved by doing away with the clear tube extension and just make the blue rubber tube longer. The clear tube comes off after three or four emptyings and only the short blue tube remains. Great drainage bag at a great price and with a anti-reflux chamber instead of just an anti-reflux valve. The hook could be improved as to hang on wheelchair. Maybe arch the hook like a rounded arch instead of the square corners of the current hook. Compared to several other brands of urine drainage bags we have tried these were the worst. The tube to the patient seemed shorter and was stiff which caused his external catheter room to twist frequently which in turn caused leakage. The clip to drain it was difficult to open and the extra piece at the end caused it to drain slow and in an irregular stream which was messy and annoying...I bought 10 of these and so far all 6 we have used have been the same. I will not be ordering these again. The do the job just like the ones with the antireflux mechanism. I am not sure if the mechanism is needed. I believe this product is the best in all way. As a nurse, I am using this drainage bag and my patients feel comfort and safety. The big advantage of this product is that the anti-reflux valve that other bags posess are on the bag itself which defeats the purpose, they still allow the entire hose full of urine to flow back up to the patient. I hope this helps you. Our home care village uses only this brand of drainage bad. I usually use it for male patients and it never gave me an issue with leaks. It keeps the liquid in place and it is also so easy to put on and remove. I highly recommend it! I love the size of this bag. It's 2000cc which means that you don't have to bother yourself often. The rest of the items are also great. If you're looking for the drainage but don't know what to choose then just order it. It is the best option you have.